Located within the historic Meierer and Frank Building built in 1909, The Nines has been renovated into a one-of-a-kind hotel. Each room is “dressed to the nines” and includes ivory leather beds, tiffany blue accents, and original artwork. Each room features nods to the historic retail past of the building while still being unique and stylish. For even more luxury, guests can stay on the Club Level rooms, which offer daily light breakfast, local beer and appetizers in a Club Lounge. The rooftop bar, fitness center, and on-site lounges offer a comfortable setting for the whole family. 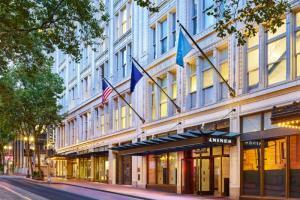 Located in downtown Portland, 12 miles from the airport.